Have you ever heard about startup named “Tasker” which has recently attracted 0,3 mln. EUR investment? Let’s read a success story shared by Arūnas Eitutis, CEO of “Tasker”. So what is Tasker? How does it work? 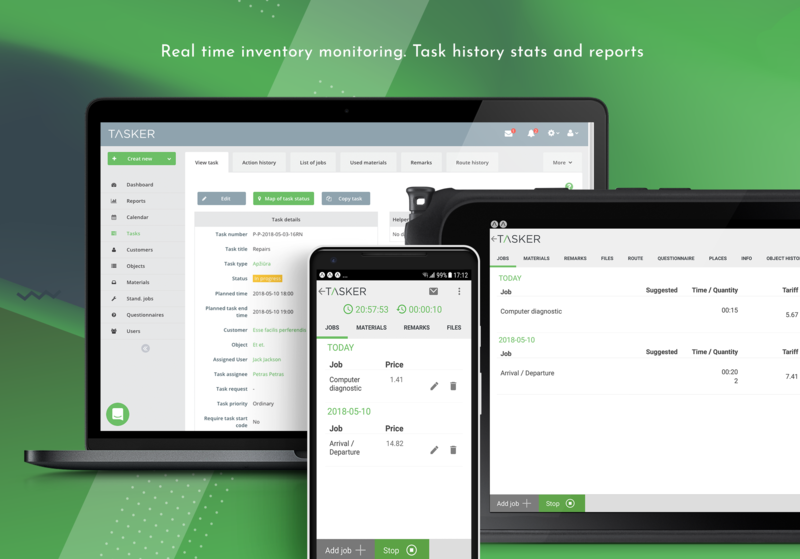 Tasker is mobile first field service management (FSM) solution which helps managing tasks, processes and employees. FSM is like CRM few years ago, so the competition is growing. But penetration in the 2bn market is still only 25% so there are plenty of space to grow and the main competitor for all FSM solutions is still paper & pen. So we are all educating the market. Customers. Tele2 Lithuania found out with the first Tasker customer Alwark (big thanks for Tadas Blaževičius) and later with others, that there is a need for such a solution in the market. So both Tele2 and iTo made a decision to invest. First version was launch on 2013.11.30. There are T-Shirts in iTo and Tele2 offices with this symbolic date and signature of founders on it. We thought that we had a product on that date, but after launch we understood that it only have ~30% of needed functionalities. First lesson learned. SMBs which have remote employees. Security, heavy machinery, facility management and vending industries are the ones we are strongest at. We were actively selling in the Baltics only until we got an investment, but is now the time to conquer the world. We are SaaS with 100% automated onboarding, so we will try to use online sales channels as well as direct sales reps to reach our next 12 months targets. One solution for such a wide range of businesses. Even in the same industries companies has different processes. So to find out which functionalities suits all of them is quite hard. At the same time, you can not overweight user interface with things which will be used only with 20% of users. That’s where the mastery of User Experience steps in and we think we are really good at it. We just got 300k 2nd round investment from Open Circle Capital and iTo. There is still an option that one more investor will join in a few months. We were break even before this round so we are pretty happy what we already done and now looking forward how could we expand to other markets. Let’s say there are two many to mention, but iTo and Tele2 Lithuania names are covering all of them. 12 mln. km. traveled, 0,8 mln. hours worked, 1 mln. tasks made with the Tasker. We are counting that our customer with our help already saved ~100 trees. We have ~50 new trial registration each month and 4.8/5.0 customers satisfactory rating. It’s a time to prove that we are desired not only in the Baltics but also in other markets.